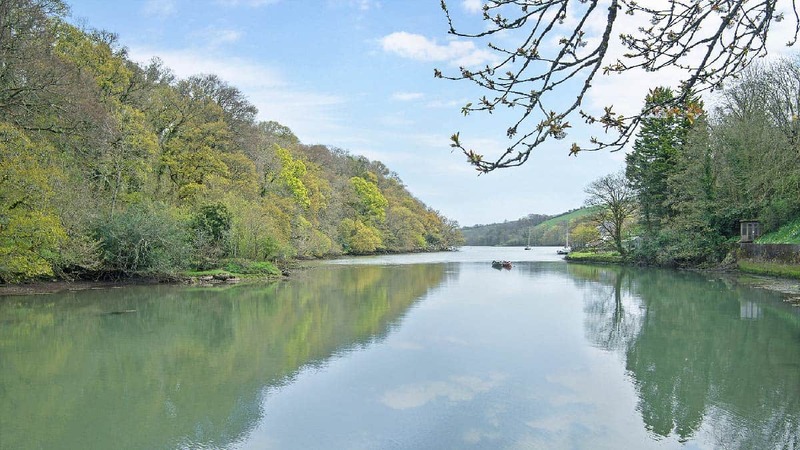 Nestled on the banks of Bow Creek, a pretty wooded tributary of the River Dart that winds its way through the village of Tuckenhay, Perchwood Shippon is a stunning haven of tranquillity. 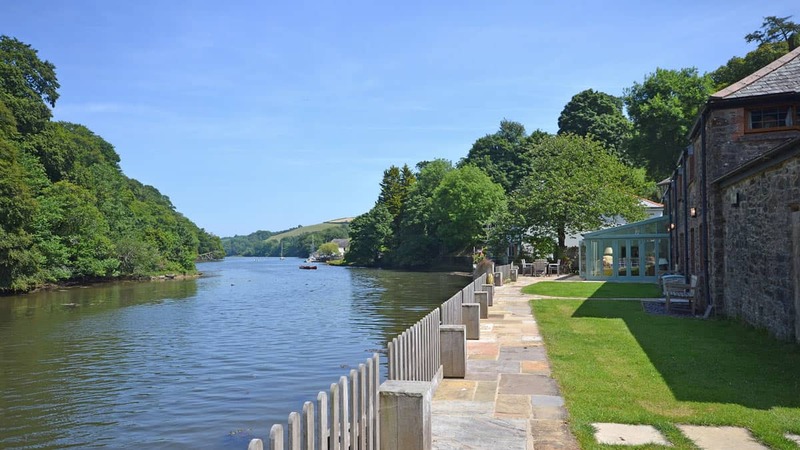 Whether you’re looking for somewhere picturesque to kick back, relax and set your clock to ‘Devon time’, or a convenient base from which to explore the bustling towns, quaint villages and magnificent coastline of the South Hams – this idyllic waterside retreat delivers on both counts. 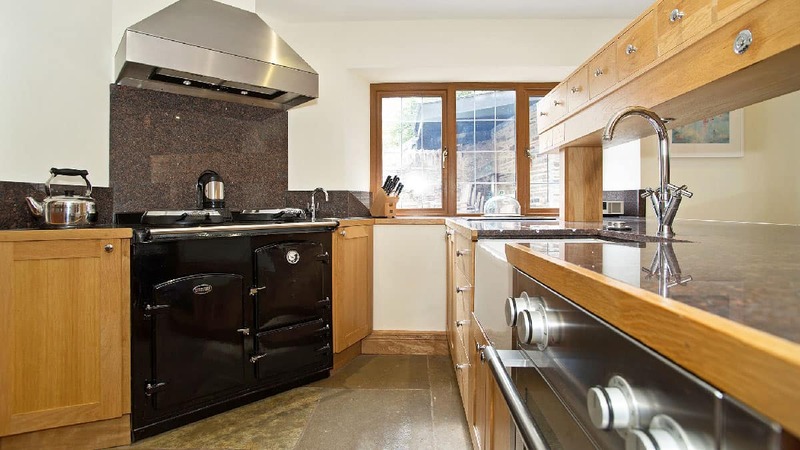 Perchwood Shippon is a spacious, exceptionally-presented stone cottage bursting with character and charm. The property sleeps up to 8 people in 4 ensuite bedrooms, with a large kitchen-dining room with island unit perfect for sociable mealtimes, a terrace overlooking the water for relaxed dining al fresco, and a cosy lounge with a wood burner to retire to on chillier evenings. The house can also be split in two and rented for a discounted rate if you only require 2 bedrooms. If you own a small boat, kayak or paddle board, the cottage offers excellent access to the creek for days on the water exploring the nooks and crannies of the River Dart. Alternatively, canoes can easily be hired at the Tuckenhay-based Canoe Adventures. Or, the nearby Dittisham Boats also offers kayaks, SUPs and boats for hire by the hour. Autumn is a particularly spectacular time of year to stay at Perchwood Shippon. This is when vibrant golden hues from the wooded banks are reflected on the water, whilst ever-increasing piles of leaves crunch satisfyingly underfoot. The days are often still warm and sunny for making the most of the beautiful Devon outdoors, but the cooler, longer nights provide all the excuse you need to cosy up in front of a log fire in a friendly pub, or back at the cottage with your favourite tipple. Book your holiday at Perchwood Shippon. Totnes – The historic riverside market town of Totnes is just 15 minutes by car. With a Norman castle overlooking the town, intriguing winding streets and passageways lined with a diverse selection of independent shops, cafes, pubs and restaurants, and a popular eclectic market, there’s plenty to keep you busy here. The town has a reputation for alternative lifestyles and green living, boasting several excellent vegetarian and vegan eateries, as well as the UK’s first organic zero waste store at the top of the High Street. 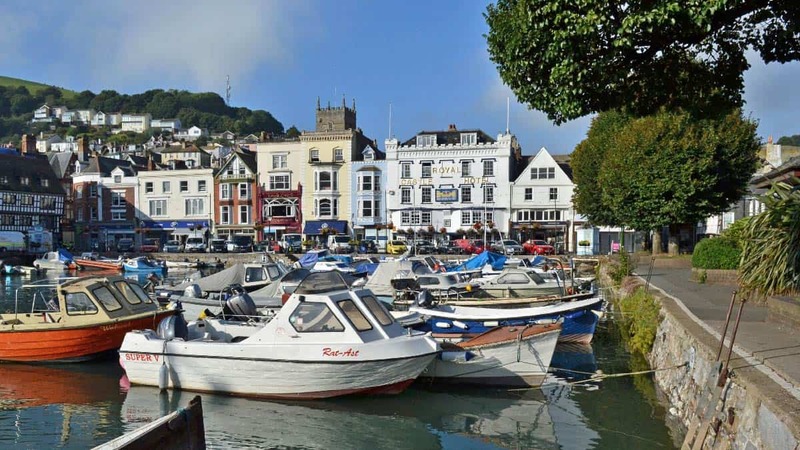 Dartmouth – This pretty estuary town, nestled on the wooded slopes of the Dart Valley, is steeped in maritime history. With its impressive castle that has guarded the river mouth for over 600 years, its bustling port, marinas, galleries, boutiques, bars and restaurants – there’s plenty to see and do here. If you’re visiting in October half term, don’t miss the town’s famous foodie festival. Greenway – The former holiday home of the famous author, Agatha Christie, offers a great day out. This beautiful house and gardens is now managed by the National Trust. Inside there is a vast collection of literary works and artefacts from the author and her era, whilst there are several stunning walks through the gardens. Green travel is encouraged to Greenway, with options including a ferry from Dartmouth, a steam train from Paignton or Kingswear, or a small boat taxi from Dittisham. Dartington Hall – The impressive Dartington Hall and Estate is a wonderful place to visit all year round – whether you feel like meandering through the grounds, exploring the stunning gardens, taking part in one of the many interesting events held throughout the year, popping into the Hall for a meal or a drink, or perhaps to catch a film, or going to the Dartington Shops to browse an eclectic mix of arts, crafts, local food and drink producers and much more. Sharpham Vineyard – This picturesque vineyard and cheese dairy, set on the banks of the River Dart, offers beautiful walks, tours and of course wine and cheese tasting. Check ahead for availability due to seasonal opening times. Blackpool Sands Beach – Just 9 miles from Tuckenhay, this unspoilt pebble beach is set in an idyllic turquoise bay sheltered by evergreens in an Area of Outstanding Natural Beauty. With a popular beach café-restaurant, children’s sandpits, kayak hire, and access to miles of magnificent South West Coast Path, this is where to come to get your fill of sea air whilst on holiday. 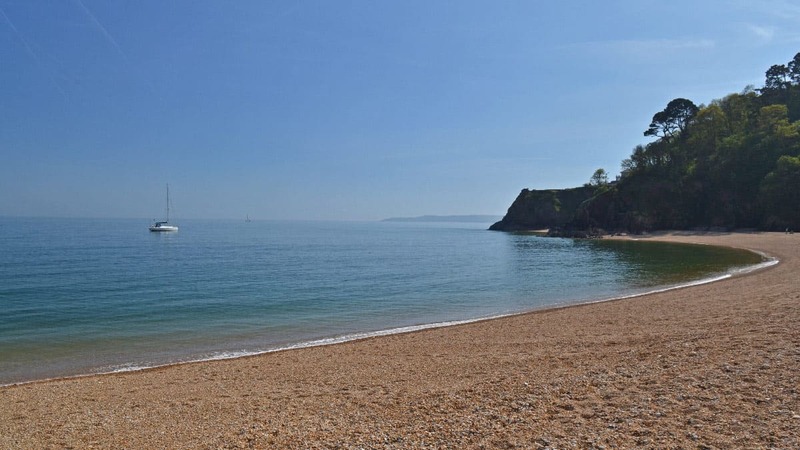 Slapton Sands Beach – Just a mile further on from Blackpool Sands, following the scenic road along the coast, you’ll find Slapton Sands beach and Slapton Ley, the largest natural lake in the South West – only separated from the sea by a narrow shingle bar. As well as being a place of immense natural beauty with abundant birds and wildlife, Slapton Sands was also the scene of the disastrous failed ‘Operation Tiger’ D-Day rehearsal in WW2, where over 700 American serviceman tragically lost their lives. You can visit the stone monument and memorial tank at Torcross. Or browse our full selection of luxury holiday cottages in the South West.